We love to eat pancakes, we have them for dinner, for lunch, as a snack and of course for breakfast. I finally got smart and put together a healthy bulk pancake recipe to keep in our cupboards. Below I will show you how to make the bulk pancake recipe and a batch of it. for those of you not looking to make a bulk mix. My kids and husband love them mostly because they can drench it in syrup and butter. After spending tons of money on pancake mix boxes that have very little nutritional value I decided to experiment with recipes and I think I finally found the perfect mix where they are tasty and fluffy! For me the perfect pancake doesn’t need any syrup. With this recipe I can enjoy them w/o syrup and not feel bad eating one or two, because I know there is nutritional value in them. One day I will get around to making my own syrup. For now, Aunt Jemima will do though, I hate buying it here because it’s so pricey. You can cut the recipe in half if it’s too much for your family but when I was making it with only 2 cups of flour I realized it wasn’t enough for our family. Plus, you can store it in an airtight container and have ready on hand for the future. Hello new reader/friend! Are you enjoying our post? We would love to have you follow along via your favorite social network :Twitter,Pinterest or Facebook and our readers preferred way via email. 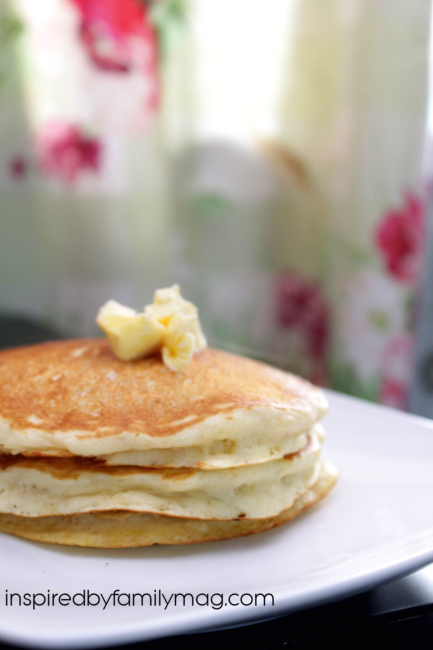 Bulk Pancake Recipe: Makes 5-6 BATCHES of small-medium sized pancakes. Mix all of the ingredients above and store in an air-tight container. If you store it for too long you may need to add more baking powder to your mix. Also, note that a hot griddle is the secret to making these pancakes fluffy. Mix the vinegar and milk to make buttermilk. After 5 minutes add the eggs and butter. Mix. Then add the bulk pancake mix to it. Now you’re all set for some amazing pancakes! Heat your griddle at medium heat add oil spray or butter to keep the pancakes from sticking. Make sure your griddle is hot by pouring a drop of mix onto the griddle. Then pour your pancake mix onto the hot griddle. I like to pour my mix into a bowl with a spout so it can pour easily onto the griddle. 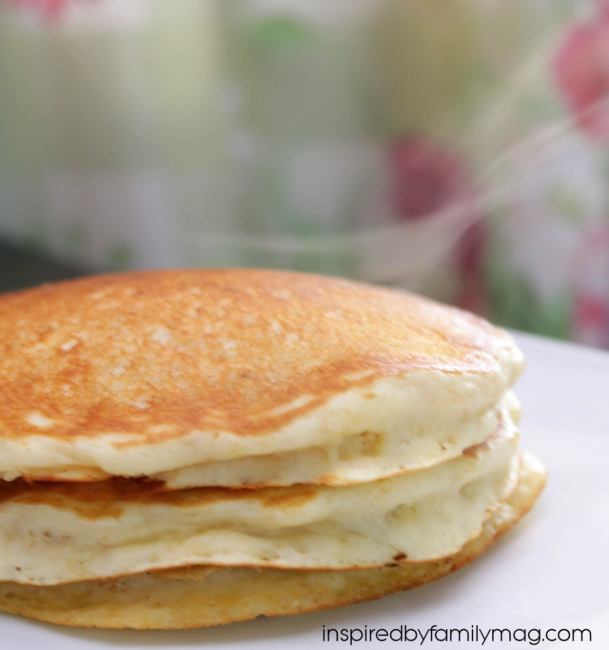 When the bottom of the pancakes are golden brown, the edges are firm, and the tops are bubbly, after about 2-3 minutes, flip the pancakes and cook until golden brown on the other side, about 2 minutes. Thank you so much for sharing your recipe! I have struggled for years with finding a pancake recipe my kids would like & I would feel good about serving them, and not only do they like these, they LOVE them! And I know exactly what’s in them (unlike those boxed mixes!) & I know they’re getting a much healthier version of their favorite breakfast ??? ?